International buffer dinner at Century Park Hotel, Rizal Park, Intramuros ( The Walled City), San Augustin Church, Fort Santiago, Casa Manila, Handicraft Center, Seafood dinner at popular Kamayan Restaurant. 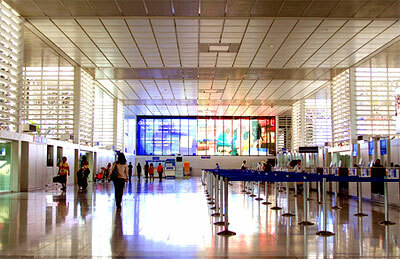 Depart by Philippine Airlines scheduled for Manila , one of the oldest cities in Asia and is Philippines' capital city. Upon arrival at Ninoy Aquino International Airport Terminal II, lei welcome and transfer to 4 * Manila Pavilion Hotel which is located within 5 minutes walking distance to the latest entertainment district of Malate. This evening, transfer to Century Park Hotel, where you will truly enjoy a sumptuous international buffet dinner. After breakfast, your half days city tour commence on a visit to Rizal Park, the national park that have became the site of many events that shape the country's history. Across the park, is Intramuros, the old part of the city that revives the country's colonial past. It encloses Fort Santiago, an old Spanish headquarters that speaks about the Filipino's long struggle for independence, San Augustin Church, one of the oldest stone churches in the country and Casa Manila, a museum that traces the way of life of the city's affluent during the Spanish era. Make a stop at a handicraft center, where you may pick some souvenirs. After a Chinese lunch, you will be drop-off at the Makati area for shopping (2 hours) and for those who wish to continue their shopping, please ensure you return back to the hotel in time for your dinner. Tonight, enjoy a delightful seafood dinner at the popular Kamayan Restaurant. During dinner you will be serenade by a band of blind musician and for a small tips you may request for your favourite song. After dinner, venture out into one of the many pubs or discotheque that is within the hotel vicinity or you may wish to trip your luck at the hotel casino. Free day at leisure, Manila, renowned as a shopper's paradise and gourmet center has plenty in-store for you to explore and sample. You may also wish to join a optional day tours to Tagaytay, Villa Escudero or Pagsanjan. Mabuhay Philippines, free until time for your transfer to the airport for your flight back to Singapore.